This highlight from our extensive 1997 Riesling retrospective delivers almost everything one can expect from a refined Auslese GK. Mature Riesling is one of the great pleasures of the wine world. This is why, every year, we dedicate the Spring Issue of Mosel Fine Wines to this topic in a bid to have our readers try it for themselves. 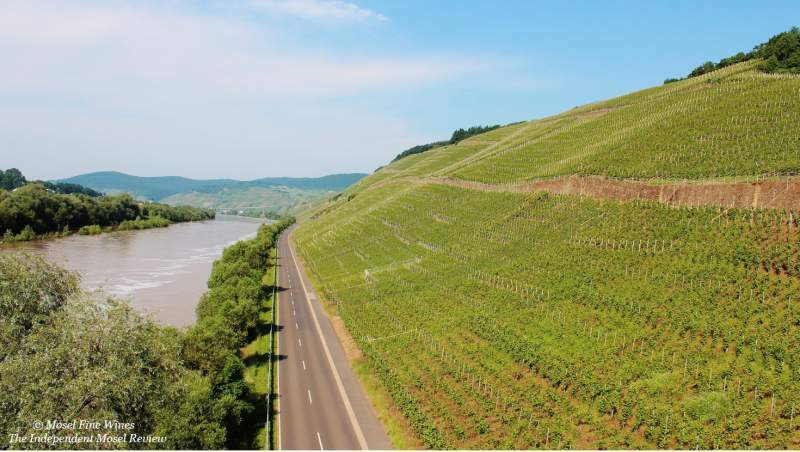 In the just released Mosel Fine Wines Issue No 34 (Apr 2017), we reviewed over 90 wines from the 1997 vintage, a mature vintage which proves pretty much the dream of any Mosel wine lover coming through. One of the highlights of this retrospective proved to be the sublime 1997er Brauneberger Juffer-Sonnenuhr Auslese GK Fuder 9 by Fritz Haag. 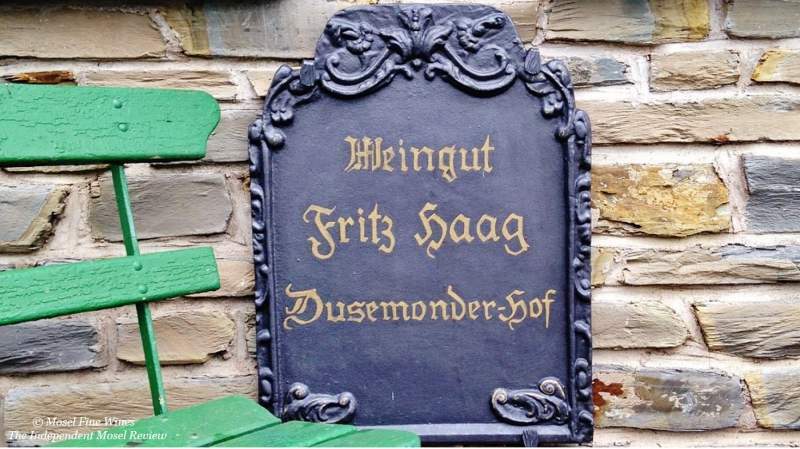 Weingut Fritz Haag is one of the great historic Estates in the Mosel which has been producing highly acclaimed Riesling ever since its ancestor, Peter Christian Conrad-Fehres, took the Auction market by storm back in the 1870s. It is during the tenure of Wilhelm Haag, the still youthful and jovial senior boss at Fritz Haag, that the Estate developed its distinctive style. This relies on raciness and precision, enhanced by a distinctive touch of citrus-scented whipped cream (which often proves a giveaway in blind tastings). This style runs particularly through the Fritz Haag wines from the 1990s. The "Fuder number" has its importance at Fritz Haag as the Estate regularly produced different casks of Auslese GK with slightly different stylistic directions (i.e. with more or less botrytis). At first, these different bottlings of Auslese GK were only differentiated by the AP Number, later the reference to a "Fuder Number" was added in small print. As of the 1998 vintage, the Estate settled for the denominations “Fuder 9” and “Fuder 12”, whereby the Fuder 9 (called #9 nowadays) is typically made from grapes with lesser botrytis impact and the Fuder 12 (#12 today) with more botrytis impact. In 1997, as Wilhelm Haag explained, "there was not much botrytis, so we only produced one regular cask of Auslese GK (next to an auction lot)." This 1997er Brauneberger Juffer-Sonnenuhr Auslese GK Fuder 9 plays on the purity of the vintage and adds this racy precision that has made the fame of Fritz Haag wines. This is simply a brilliant wine. 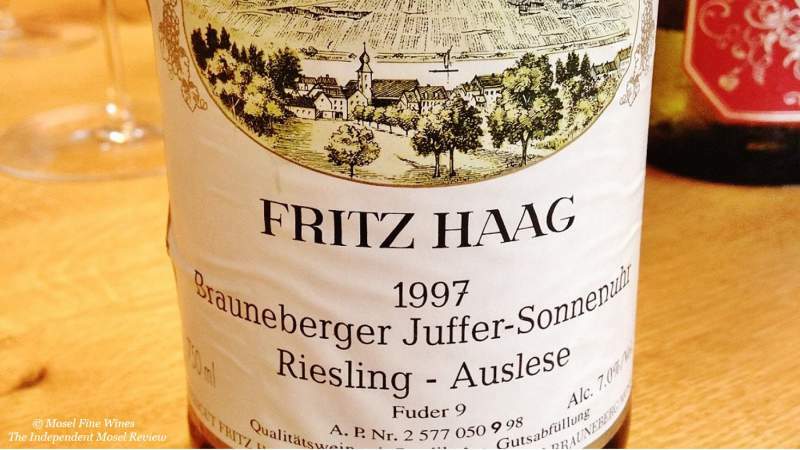 Should you not have this particular Auslese at hand, overall, Fritz Haag proved hugely successful during that decade: We have yet to have an Auslese from the 1990s which is short of outstanding. The full 1997 retrospective with more more than 90 Riesling retasted was published in the Mosel Fine Wines Issue No 34 (Apr 2017). You are a subscriber and miss this Issue? Simply send us a request by email and we will be happy to send you a copy. You are not yet a subscriber and wish to get this Issue? Subscribe free of charge by registering yourself here below and ask us for a copy by email.